Wandering the icy streets of your winter travel destination is a stylish and warm experience with The North Face Metropolis Parka II. Make sure your old winter coat isn't listening, because there's a new boss in town! The North Face Metropolis Parka II is the perfect solution of urban trekkers on the move. Never again will you be slowed down by chilly wind gusts or a light snow shower with this on your back. The supreme warmth, utility, and style make this one of our favorite parkas to complete your winter wardrobe. The North Face Metropolis Parka II checks all of the boxes for year-round travelers undeterred by a little chill. Read our review to find out all of the great features and benefits of the North Face Metropolis Parka II! From its humble beginnings in 1966 as the brainchild of two San Francisco based hiking lovers, The North Face continues to deliver. 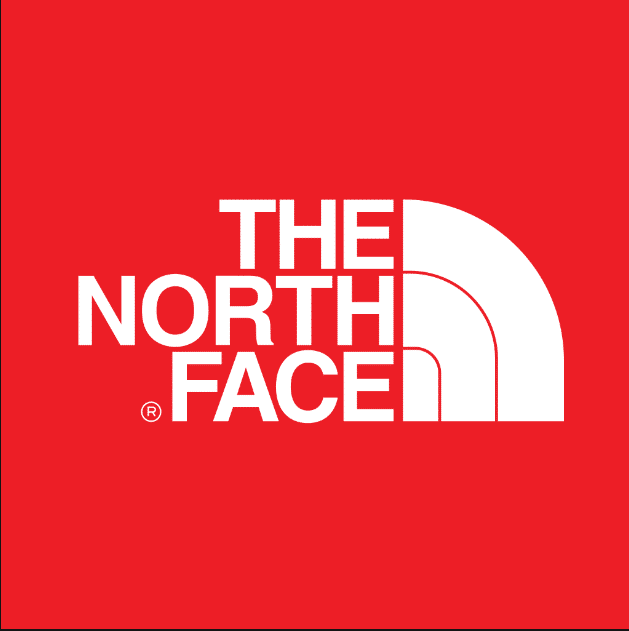 Established as a small mountaineering retail store, The North Face, as it came to be known, specialized in offering gear, apparel, and footwear with innovative twists. Living the company's mantra of "Never Stop Exploring," became easier with the evolution of the brand. For instance, the 1990s ushered in an era of Tekware™ which amplified the already superior fit and function of The North Face's products for outdoor enthusiasts. In similar fashion, Thermoball and Fuseform technology led the way in further enhancing the company. It's no secret -- The North Face delivers only the best. This delivery comes in the form of the values espoused by both the mission of the company and the products it manufactures. With its focus on providing the best gear to athletes and explorers, The North Face also manages to preserve the outdoors and catalyze global exploration. Although a difficult feat to tackle, the brand meets and exceeds expectations of trekkers near and far. If ever there was a tangible example of company's commitment to making the best gear, it comes in the fashion of The North Face Metropolis Parka. This supremely warm, stylish, and functional winter coat is exactly what you need to keep you looking good while staying cozy. Check out our review for all of the details you've been searching for in your next parka. We'll cut straight to the chase-- the North Face Metropolis down Parka II is as warm as they come, covering your hips and thighs. No longer will winter travel have to cease due to the nip of the air. This ski and snowboard parka packs a punch! Now, all you need to do is pair it with some cozy women's footwear like water repellent boots and fleece lined pants. Nordstrom Rack has some pretty good women's shoes. 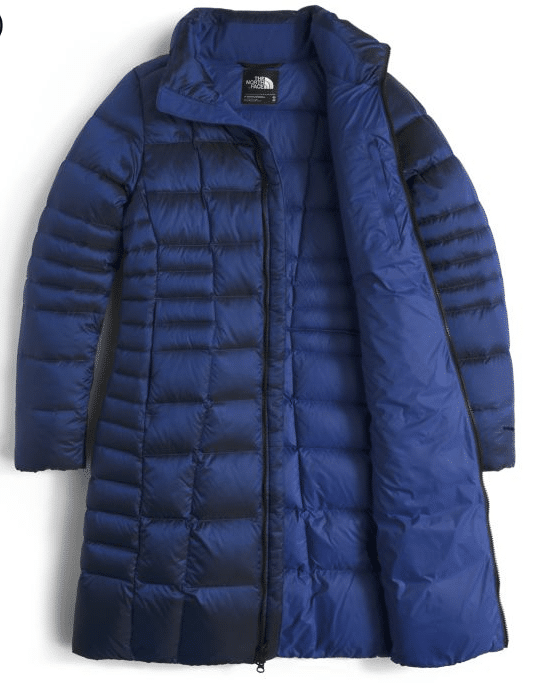 The women's North Face Metropolis Parka II features a 550-filled down design. 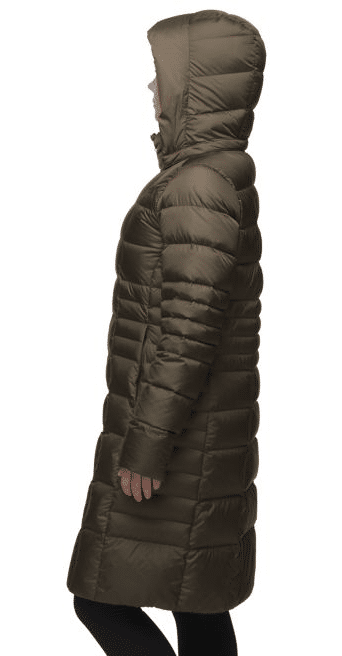 The extra length at the bottom of the coat combines with the down fill to protect your head, shoulders, torso, hips, and thighs from the elements. This factor allows for extra time trekking that other coats might not afford due to their poor design and lesser materials. Serious urban adventurers won't let a bit of ice or snow scare them off the scent of exhilaration. In addition to the cozy down, the North Face Metropolis Parka II utilizes other aspects to maximize the warmth of the wearer. To enumerate, the hood is comprised of a down cocoon brim. This seemingly small feature serves to add warmth and protection. Similarly, the covered and zippered hand pockets keep your comfort in mind. Resting your hands in your pocket still affords you the wrist coverage garnered by the flap of fabric. Not surprisingly, this is one of the warmest parkas around! You only feel as good as you look. This mantra also extends to the winter coat with which you choose to travel. The North Face Metropolis Parka II makes it so you don't have to choose function over design. Now, you really can have it all! The problem with most parkas is that it's all too easy to lose your curves and sense of fashion within the cumbersome insulation layers. The North Face Metropolis Parka II combats this with its contoured quilting around the waist. This makes for a flattering fit and provides definition to enhance your natural silhouette. Furthermore, the darts on the back of the waist assist in shaping your frame. Of all the North Face jackets on the market, this one is at the top of our list. One of the best features of The North Face Metropolis arctic Parka II is that it puts the power of choice back where it rightfully belongs -- in your hands. This jacket can be customized in that the hood is removable and easily snaps on and off. Depending on the weather, your destination, or which hot spot you have reservations at, being able to detach the hood can quickly change up the overall appearance of your look. Functional and fashionable! As with all things in life, balance is key. The North Face Metropolis Parka II can look as good as it wants. However, without its practicality and functionality, it would be nothing more than your average, not-so-able-to-withstand the winter coat. Good thing the North Face Metropolis Parka II earns its keep! The materials and zippers of The North Face Metropolis Parka II are simply two ways that this jacket maximizes its own functionality. The 100% nylon with a durable water repellent finish keeps that misty rain off your parka and your person dry and warm. Moreover, the two way front zippers are easy to manage and promise not to get caught in the fabric. Innovation is key at The North Face. This is evident in the brand's evolution of its products to provide trekkers with the luxuries of the modern world. The North Face Metropolis Parka II does just that with its media compatible pocket. Now you can easily put your headphones in place and vibe out as you wander the streets of your winter travel destination. It helps to have some peace of mind when making a wardrobe investment purchase. The North Face serves this up to travelers in a myriad of ways. Thus, it is easy to see how the company lives the values it promotes. We doubt that you will have any issues with your North Face Metropolis Parka II. Even still, if your purchase doesn't meet 100% of your expectations, you have some recourse. To illustrate, The North Face's products are warranted against material and workmanship defects. You simply need to reach out to take advantage of this benefit. Once again, this company proves that it stands behind its parka and its customers! The increasing awareness of animal rights in the fight to end cruelty has touched The North Face, just as it has the rest of us. In its commitment to its values, the company ensures that the down used in its jackets do not come from animals that have been harmed or tortured. Thereby, fear that the down in your jacket came from an animal that was force fed or live-plucked is totally eliminated. By adhering to the Responsible Down Standard set forth by the Control Union, The North Face is able to track the down used throughout its lifecycle -- from farm to garment. This chart is helpful for several reasons. Travelers should deduce that while this jacket is not exactly for rainforest conditions, it is warm, breathable, and heavy duty. The parka is designed with winter city travel in mind. While this may not be the best option for those hiking the Himalayas, it does an awesome job of living up to its duties. We've read all of the reviews available regarding The North Face Metropolis Parka II. Honestly, the overwhelmingly positive feedback left by travelers made it difficult to find much fault in the product. Nonetheless, we've compiled all of the pertinent details you need to assist in making your decision. Although super comfy, this parka is also super stylish! Being that this is a parka, it can constrict movement a bit. For high octane activities, this is probably not the best choice. However, for winter city strolls, this is the parka for you! Although not perfect, The North Face Metropolis Parka II comes quite close. Travelers love that they can rely on this product to keep them warm and dry while abroad. Now, waiting for the summer weather to hit all of those travel hot-spots is a thing of the past. With this on your back, you won't ever worry about seasons or warmth again! As great as The North Face Metropolis Parka II is, it's possible that this isn't the perfect fit for you. That being said, we've also included a few alternatives to guide your search for the best parka. Check out these great options to keep you warm! Another favorite of trekkers worldwide is the Eddie Bauer brand. 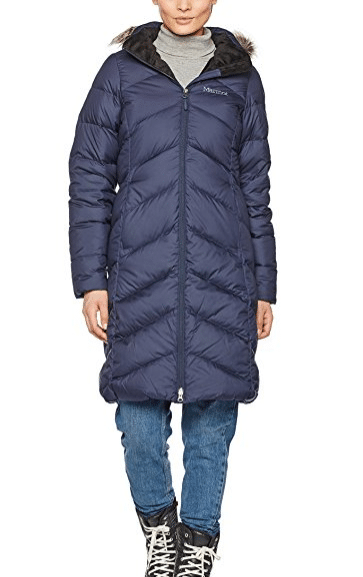 Their Women's Sun Valley Down Parka goes the extra mile to ensure you are toasty at all times. This is accomplished with a mixed material design composed of 53% nylon, 32% polyester, and 15% cotton shell. In addition, the 650 fill premium down adds an extra layer of protection to the already stellar design. However, that's not to say that this jacked it bulky. Rather it has the perfect fit all around -- it's neither too tight, nor too relaxed, making it perfect for fitting over your ugly Christmas sweater. The two-way front zipper combines with a snap-off hood with faux fur that is detachable, as well as fleece-lined pockets, and adjustable interior storm cuffs to lock in heat. The best part about this parka? -- It's machine washable! Travelers will not be disappointed in Eddie Bauer's Sun Valley Down Parka. 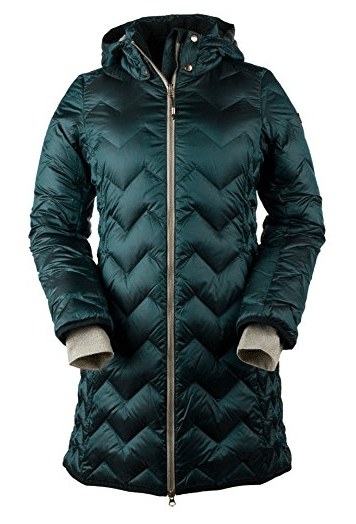 Similar to the North Face Metropolis Parka II, the Obermeyer Women's Devi Down Parka is a looker! You won't be ashamed to claim your parka when its as stylish as this one. Obermeyer's product utilizes 100% iridescent ripstop Nylon to create one of the warmest and most durable jackets. The HydroBlock durable water repellent finish ensures that you stay dry, regardless of whether your precipitation source is rain, sleet, snow, or hail. 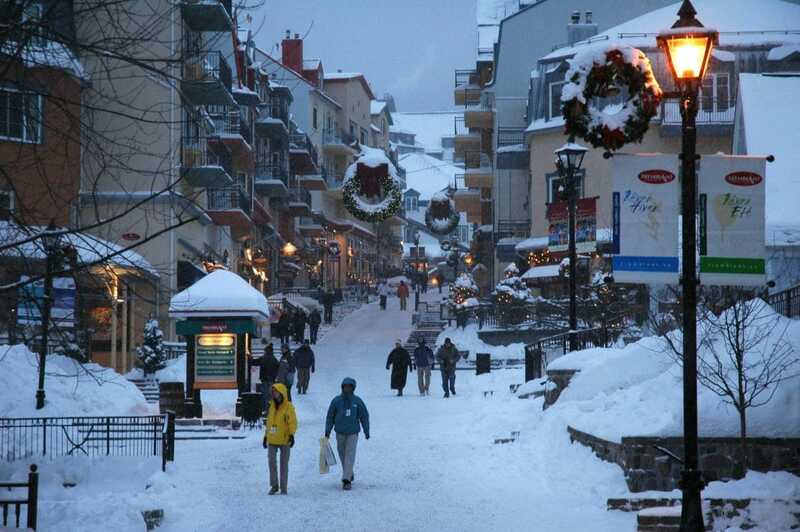 600 fill duck down provides the ultimate level of warmth and comfort for walking the snowy streets of your winter travel destination. With shaped seams and a full-length silhouette, Obermeyer's parka adds definition and style to your physique. That's not all though! 2-way YKK Meatluxe zippers on the front combine with a removable down-filled hood, zippered interior hideaway pocket, and a plush fleece-lined collar to make this one of our favorite alternatives! Marmot's Women's Montreaux Down Coat is something you won't want to leave the house without on those bitter winter days. You certainly won't want to forget to pack it in your suitcase for your winter getaway either. The full length jacket incorporates various materials to ensure the coat is as warm as can be. For example, the shell is made of 100% polyester with a durable water repellent finish. The inside lining also features 100% polyester -- a design mechanism that is greatly enhanced by the 700 fill power down with down defender. If you still don't think this parka will keep you warm enough, consider this: two handwarmer pockets, a fleece lined torso, and micro fleece internal cuff work together to promise you the maximum level of heat retention. Not to worry though, on days when the sun is beaming, the down filled hood can be removed. Travelers love that this parka is as versatile as they come! Put fashion on your back with The North Face Metropolis Parka II. 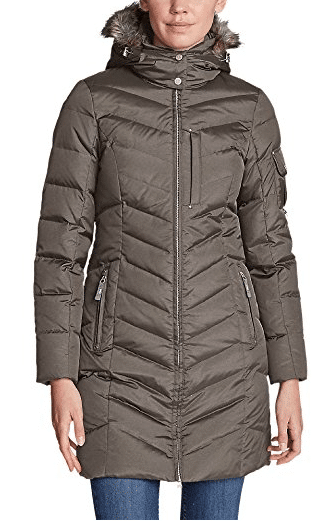 Women love The North Face Metropolis Parka II for a myriad of reasons. With its warmth, style, functionality, and quality, it's no surprise that this parka is the leader of the pack. Trekkers with a penchant for looking good while they stay warm are in for a treat as they take on the wintery streets of their top winter destination. With this parka, you're unstoppable! Are you the proud owner of The North Face Metropolis Parka II? Tell us your thoughts on the product in the comments section. Wishing you warm and happy treks this winter!